No, of course, I kid. I did find this lovely sketch searching for things to tweet about, though, and Kat was kind enough to allow me to use it -- we'll see if she still feels the same way after this blog post goes live! The art is called "Chasing Dreams," and I just love the sense of movement in it. I also really like how this is a true lion centaur, that is, fully human from the waist up. The original is here at Deviant Art. 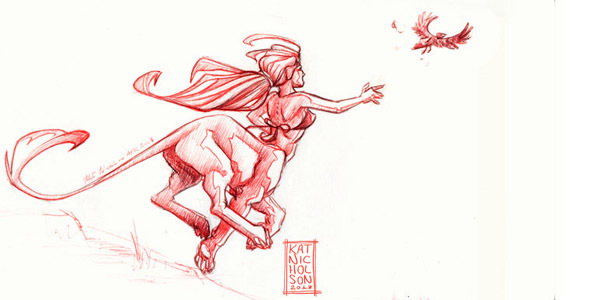 May I add my personal opinion that "Kat" is the best name ever for an artist who draws wemics? My mom's name is Kathleen, and I think I'll start calling her that. Check out more of Kat Nicholson's amazing (and, literally, fantastic) art at her professional site at katnicholson.co.uk. And make sure you check out her work on Thundercats!